According to LinkedIn, they're hiring! 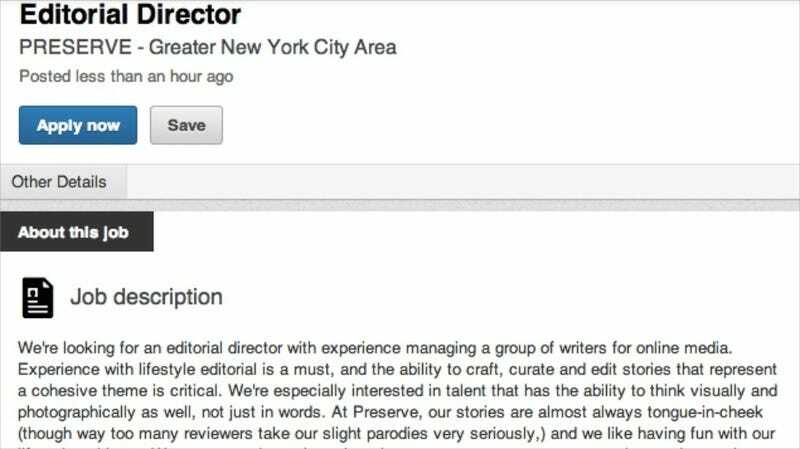 We're looking for an editorial director with experience managing a group of writers for online media. Experience with lifestyle editorial is a must, and the ability to craft, curate and edit stories that represent a cohesive theme is critical. We're especially interested in talent that has the ability to think visually and photographically as well, not just in words. At Preserve, our stories are almost always tongue-in-cheek (though way too many reviewers take our slight parodies very seriously,) and we like having fun with our lifestyle subjects. We curate products through recipes, poems, essays, commentaries, and any other form the written word can take — and we need someone who can keep that "let's-not-take-ourselves-too-seriously" essence going through all our content — curated, and original. Oh it's all tongue-in-cheek. Got it!